With soaring temperatures in Jodhpur, it’s no wonder the local boys find the emerald green water of Toorji Ka Jhalra stepwell so tempting 🙂 And to be honest, at that moment I genuinely envied them. The blue city of India was as charming as I imagined it to be. So I’ve been to Jodhpur last months. Yes, May is the worst time of the year to visit Rajasthan, and yes, it was extremely hot. But as a super busy mom of three kids with a limited travel budget, I’m not in any position to turn opportunities down. I had a chance to visit Jodhpur and I went. Do I regret it? No way! The blue city of India was as charming as I imagined it to be! And to combat the heat, I just drank gallons of water and cold drinks, applied the sunblocks lavishly on my face, neck, and arms, and tried to stay in the shade as much as possible. I won’t be writing a very detailed city guide with all the things to see and do in Jodhpur. We already have a rather informative guest post on the site with lots of secrets revealed by a local. But I hope these Jodhpur photos will inspire you to make a trip to the blue city and to see all these beautiful places with your own eyes. 1 Why is the city blue? ~ Blue color has been associated with Lord Shiva and there were many Brahmin followers of Shiva in Jodhpur who considered this color sacred. ~ Blue reflects heat, and Jodhpur often reaches 45C + in the summer. It’s possible that the houses were painted blue to lower the temperature inside. ~ There were many indigo plantations near Jodhpur, and that made the color blue easily available. 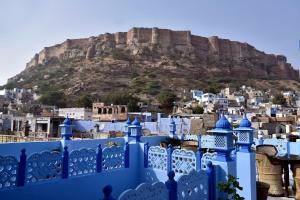 ~ The houses were painted blue for the sake of the beautiful view for the rulers to admire from the Mehrangarh Fort. ~ The Blue City would have attracted traveling traders passing through Rajasthan. But whatever the reason, the city is charming and you’re bound to remember your visit for years to come. During my short visit to Jodhpur, I managed to see quite a lot. My itinerary started from the mighty Mehrangarh Fort, which is undoubtedly the centerpiece of Jodhpur. Downhill from the fort, there is Jaswant Thada, a beautiful marble cenotaph, widely known as the Taj Mahal of Marwar. After exploring it for an hour or so, I took an autorickshaw and headed to the bustling area of the Sardar market. With the imposing Ghanta Ghar (clock tower) standing proudly in the middle and lots of colorful stalls, it’s an interesting place to explore. 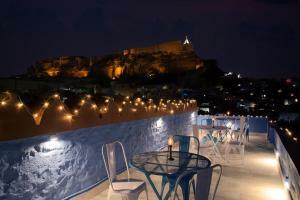 Offering a restaurant, Jewel Palace is located just 1312 feet from the famous Mehrangarh Fort. Offering a sun terrace and views of the mountain, Suraj Haveli is located in Jodhpur, 0.6 mi from Mehrangarh Fort. Guests can enjoy the on-site restaurant. This entry was posted in Rajasthan and tagged Jaswant Thada, Jodhpur, Mandore Gardens, Mehrangarh Fort, photography, Rajasthan, street photography by indiapalette. Bookmark the permalink. Thanks, Jyotirmoy. I enjoyed my photography experience in Jodhpur – there are so many opportunities for a good photo in this city! Loved the post. Awesome pics . Thanks, Rupam. I found Jodhpur exceptionally charming and special – hope it’s been transmitted through this post. I’d like to visit Jodhpur, again. So beautiful! Definitely somewhere I plan to go one day! I love your explanation of why it is blue as well! Yes, some of them are hard to believe, while others are more realistic. Hope you’ll make your way to the blue city one day, Amber, and thanks for stopping by. I’m thrilled to see this much of the city. Next March I’ll be visiting Jodhpur and Delhi. Thank you and I love your captions. Glad to took off to see the city and share. Oh, I’d be very curious to know your impressions of Jodhpur and Delhi, Elaine! Absolutely stunning!! I love the background of this page too as it just transports you to India itself. Beautiful shots and colours! Beautiful photos! I am definitely tempted to visit now! Glad to hear that, Julie! This place looks amazing, and your photos are incredible! Definitely adding this to my bucket list of places to visit when I’m there. Thanks, Hannah! The city was truly amazing, and I do feel the photos didn’t do it justice. But I’m glad you liked them! Such lovely images. I love the architectural detail. It seems that Jodhpur has delivered you the things which it has. Luckily you also enjoyed its majestic beauty. Thanks for sharing these amazing photographs. Loved them. Thanks, Sapna. The city is very photogenic! Amazing photos! Love the view of the blue houses. Wow! Your pictures made me fall in love with Jodhpur, Antonina. Thanks for showing it in the perfect light. How many days would be enough to see all the highlights there? Glad to hear that, Agness! I think 2-3 would be perfect. Hey, tonya, It’s been so long! I see you’ve been busy. I’ve just stayed in my home all this time. But yeah, nice architecture. I love the Indian culture too, so we have something in common! What food and drinks have you tried there? Well, I’m not much of a foodie, though I admit the Rajasthani food deserves all the love. In Jodhpur, I just had that egg sandwich I mentioned in the post, and a delicious veg thali. Oh hell yes, I love those! Had it been spicy at all or not? Yes, it was spicy, of course, but nothing I couldn’t handle 🙂 Spices are not a problem for me after all these years in India. Such a lovely collection, I totally love Toorji Ka Jhalra! Oh yes, that stepwell looks stunning and very refreshing. Utterly the BEST city in all of Rajasthan! Loved Jodhpur, even if it took ages to realise I have been spelling it wrong! lol. Great post and pics! Thanks, Andrew! I’ve been only to Udaipur and Jodhpur so far, and I equally liked them both. Let’s see what Jaipur is going to be like – I’m visiting the pink city of India in a couple of weeks!